Paul-Joseph Cyrot, at the time director of the Château de Pommard and Clos de Tart Morey-Saint-Denis, founded this estate in the 1920s. Four generations have followed each other since, at the Domaine, each bringing new parcels of vines: Burgundy, Volnay, Maranges 1er Cru, Santenay 1er Cru, Pommard and Pommard 1er Cru, an exceptional terroir for Pinot Noir. In 1989, Olivier, his great-grandson, took over the estate. With his wife Fabienne, they manage the 6 ha family estate. The domaine uses traditional viticulture and winemaking practices with the purpose of respecting nature and the soil. They farm sustainably. The grapes are hand harvested, undergo a pre-fermentation maceration with pigeage and pumping over. After 15 to 20 days of maceration, the wines are pressed and aged in oak barrels, 30 to 40% new for 12 months. The wine stays on the lees and is racked once to maintain fruit character. After a light filtration, the wines are bottled after 15 to 16 months depending on the vintage. 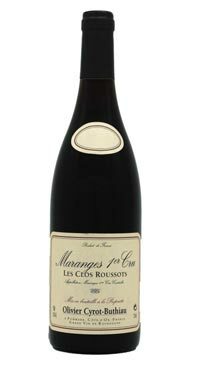 This wine is from the appellation of Maranges 1er Cru Les Clos Roussots located in the southern part of the Cote de Beaune. It is an expressive and elegant Pinot Noir.